Each wedding is highly individual and reflects your unique love story. 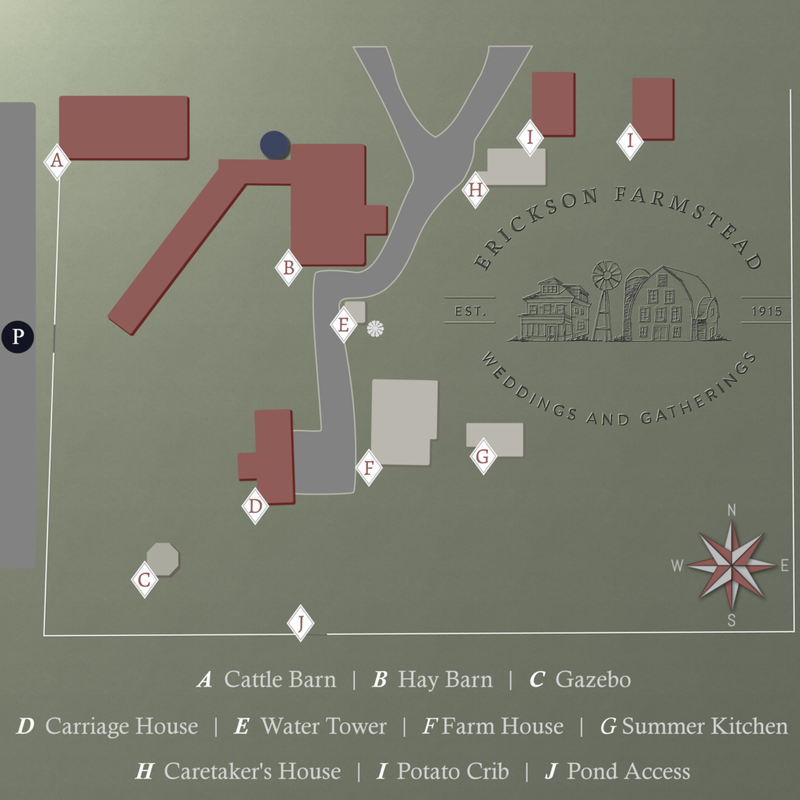 No matter what you have dreamed up for your day, the Historic Erickson Farmstead is the place for you. With forty acres and multiple buildings, this historic farm will make your day unforgettable. Allow us to handle all the details of your space, so you can enjoy a perfect day with the people you love. At Erickson Farmstead, we believe that your wedding day should be exactly like you have envisioned and we work to make that vision a reality. Each wedding package includes exclusive access to the entire 40-acre Farmstead, seating for up to three hundred guests, vintage church pews, harvest tables, dessert bar, gift table options, and so much more. Starting at $5,000, we craft each package to reflect your love story. Whether you want to party the day away on a Saturday or are looking for a more simple, peaceful day midweek, we can help you out. For a complete list of package items included, please contact us at 612-520-1825. A gorgeous, ground level barn, the Wedding Barn comfortably hosts all your guests for the reception. Vaulted ceilings, original tin siding from 1925, and open rafters bring a sense of elegance and charm. The Carriage House, built in 1918, houses our bar, a fireplace, and is the coziest spot on the Farmstead. Used for cocktail hour and dancing, you and your guests will adore the magic and atmosphere of the Carriage House. The Bridal Suite includes a Loft and a Dress Room. The Loft is the perfect place for all your bridesmaids to get ready. The Dress Room is a more intimate space, ready for the bride to put those last few touches on for the day. Ready for the men, our Groom’s Suite is a two room suite on the second floor of the Farmhouse. Serving as the stunning backdrop for ceremonies, the Lake reflects the true north nature of the Farmstead and of Minnesota. From the ceremony to the reception, we provide and set up unique spaces for each part of your day. All of your seating and table needs are included in your wedding package. Your wedding day matters to us. Each wedding package includes exclusive access to our Farmhouse, Lake, Carriage House, Wedding Barn, and gazebo. Each space is curated to give you and your guests an exceptional experience through meeting the specific needs of a wedding day. The Erickson Farmhouse, a three-story building with a peaked roof and square in shape, was built in 1915. The Farmhouse boasts five bedrooms, including the bride and groom suites, and a large, open loft on the third floor. With windows facing to all four points on the compass, the loft is light, airy, and tucked away from the hustle and bustle of the rest of the Farmstead. The Farmhouse is the perfect place for family gatherings, bridal party suites, showers and birthday parties, weekend rentals, corporate retreats, business meetings and parties, community events, and small indoor wedding ceremonies. The Carriage House is one of the most unique buildings on the property. With original sliding doors, the Carriage House will welcome you and your guests to relax and enjoy themselves. With a bar area and a fireplace, the Carriage House can comfortably host cocktail hour, gift openings, the reception dance, or an intimate dinner on the Farmstead. The Farmstead has a lovely, white gazebo and the lake as the back drop for each ceremony. With the option of chairs or vintage church pews for your seating, guests will be enchanted and comfortable. Secondary ceremony spaces include the lake side, under the birch trees, or inside the wedding barn. Perfect for a ceremony or your reception, the Cattle Barn is beautifully lit with strung lights, set with a unique backdrop, and has space for all of your guests. With four sliding barn doors, the wedding barn opens to the south, with views of the lake, the gazebo, and the birch forest. The Bridal Loft is the second of two bridal suites. At over 750 feet, it’s equipped with hair and make-up stations for all of your bridesmaids, natural light from windows on each side of the house, couches and comfy chairs for relaxing before your big moment, and space to spread out as you get ready for your ceremony and reception. The Grooms’ suite is comprised of two rooms on the second floor of the Farmhouse. With close access to the second staircase in the Farmhouse, there is plenty of room for the guys to spread out, get ready, and still have access to the kitchen and grounds of the Farmstead. Hay Loft | Coming Soon! The original barn to the property boasts unique architectural aspects, including the Gothic style roof. There are stables on the ground floor and a hay loft on the upper level. Attached to the barn is a blue silo, an extended annex, and a feed run. We have exciting renovation plans for the hay loft's future. Stay tuned for construction updates. The Farmstead is waiting for you. With Highway 65 directly to the East, the Farmstead sits on 261st Avenue and is surrounded by a white fence. Directly to the south sits an eight acre lake and our fire pit.